by Michael Kern D.O., B.C.S.T., A.B.D., N.D. The Craniosacral concept focuses on how we function in mind, body and spirit, on subtle levels of physiology. At the basis of this concept is an understanding about the workings of the Breath of Life and the critical role played by its rhythmic motion in distributing our essential forces of health. In this article we will explore some of the different aspects of the integrated physiological system of the Breath of Life, referred to as the Primary Respiratory System. Life is expressed as motion. All living cells demonstrate this basic truth. They breathe with the Breath of Life which vitalises them and maintains the numerous physiological functions necessary for survival. As the Breath of Life is expressed in the body, a series of tide-like rhythms are generated throughout the body, producing subtle involuntary movements of all fluids and tissues. This motion significantly involves the central nervous system, the cerebrospinal fluid and surrounding membranes and bones. The manifestation of these rhythms in the body denotes the effective distribution of the Breath of Life and is indicative of healthy function. The cyclical rhythms of the Breath of Life have two phases of motion. These can be thought of as a “breathing in” and a “breathing out.” These phases are called primary inhalation and primary exhalation. Generally speaking, during the inhalation phase a subtle motion occurs in fluids and tissues, which rise upwards and at the same time expand from side to side (while shortening from front to back), oriented around the midline of the body. During the exhalation phase, the opposite occurs: a motion that generally recedes down towards the lower part of the body and narrows from side to side. These movements manifest in all parts of the body, producing rhythms that have been scientifically measured and can be palpated by sensitive hands. The combination of an inhalation and an exhalation phase constitutes one rhythmic cycle. From the core of our being a succession of rhythms emerge, creating a whole system of primary respiratory motion. Three main rhythms have been identified. These all express phases of inhalation and exhalation at a different rate and are sometimes referred to as the “three tides”. The Cranial Rhythmic Impulse (C.R.I.) describes a slight involuntary rocking motion of all fluids, bones, tissues and organs in the body. At this level of function, individual tissue structures behave like boats gently rocked on the surface of the ocean. The C.R.I. occurs at an average and variable rate of between eight and twelve cycles each minute. This motion is primarily an expression of how individual parts of the body move in their relationship to each other. During each phase of the C.R.I., each tissue structure expresses a specific pattern of motion, sometimes called Craniosacral motion. The midline structures of the body rock backwards and forwards in motions referred to as flexion and extension, and the paired structures rock outwards and inwards in motions referred to as external rotation and internal rotation. The movements of flexion and external rotation both occur in the inhalation phase of the C.R.I. Extension and internal rotation both occur in the exhalation phase. The fluids of the body (i.e. cerebrospinal fluid) express this motion as a longitudinal fluctuation, rising up the body in inhalation and receding in exhalation. These movements can also be thought of as individual waves that ride on deeper tides. The cranial rhythmic impulse is considered to be the outermost (i.e. most superficial) unfoldment of the Breath of Life. It is produced as a result of how our deeper forces of health interface with any conditioning or experience held within the body. There has been much debate in the profession about what exactly causes these rhythmic impulses. Some practitioners believe they are generated in response to a cyclical production and reabsorption of cerebrospinal fluid. Others place an emphasis on the motion of the central nervous system. There is also a suggestion that the C.R.I. is produced by involuntary muscle contraction, causing the delivery of a rhythmic movement to cranial bones and the central nervous system. Still others believe the C.R.I. is produced by a combination of many different factors, including lung breathing and arterial pulsations. In the entrainment theory it is suggested that there is a pooling of various motions and pulsations produced by both patient and practitioner.3 A coherent rhythm may be created as these pulsations harmonise together. Clearly this is a subject where further research is still needed. Whatever the particular mechanisms that produce or disseminate the C.R.I., there still remains the question of what moves these mechanisms? If we wish to investigate the actual origins of this motion, there is good reason to suggest the crucial presence of an underlying vital force, the potency of the Breath of Life. I emphasise this perspective because it is frequently not included by those who take a more mechanistic approach. The mid-tide is considered to carry the available bio-energy, or biodynamic potency, that vitalises the body. As such, it fundamentally is an expression of our health. In the inhalation phase the mid-tide rises up the body and widens from side to side, a motion that simultaneously involves the whole field of potency, fluids and tissues that all breathe together as “one thing.” In the exhalation phase the mid-tide recedes down the body and narrows from side to side. Individual tissue structures generally follow the same patterns of motion found with the cranial rhythmic impulse, but as parts of this whole unified field of motion instead of as movements of individual structures. This motion is naturally orientated around the midline of the body. The rate of the mid-tide is far less affected by our immediate conditions than the C.R.I. Its rate is consequently less variable. In essence, the mid-tide is an expression of the embodied forces of the Breath of Life. The biodynamic potency expressed within the mid-tide is of great significance because it carries into the body the essential ordering forces of the Breath of Life. Therefore it has a profound ability to maintain balance and physiological integration at a core level. The potency of the mid-tide promotes health and healing in all tissues where it is able to manifest. Palpation of the mid-tide gives the practitioner a clear relationship to the way in which intrinsic health is being expressed in the body. When the mid-tide is tuned into, it is often experienced as a sense of unity and well-being permeating the body, bringing a feeling of wholeness. It may be felt by settling into a state of greater stillness and taking a wider view of ourselves. One patient described an experience of the mid-tide in his own body “like slipping down a boat ramp and sliding into the water.” 8 In fact, accessing the mid-tide is like dropping beneath the waves on the surface of the ocean. It can be compared to being in a submarine rather than a boat. As the potency of the mid-tide is expressed in tissues and fluids, it causes them to “breathe” simultaneously at this slower rate. This inner breathing of tissues is called motility. All living structures express motility, including even seemingly hard and rigid ones like bones. Our usual perception of bone as a hard and lifeless substance is derived from the fact that only dead and dried specimens are usually examined. However, when teaching this work, Dr. Sutherland often implored his students to focus on what occurs in living tissues.9 Living bone is full of life and motion. It contains a high percentage of fluid and a blood and nerve supply, and it possesses a remarkable degree of flexibility. Fluid can be seen everywhere in nature as the carrier of life; without water, there is no life. All living organisms contain a large proportion of fluid. In fact, each cell of the body can be likened to a tiny sac of fluid, in which its microscopic internal structures “float.” However, when life departs and organisms die, they dry up. It is interesting to note that whenever scientists look for signs of life on other planets, they first look for signs of water. Consequently, it is the fluid systems of the body that distribute the essential potency of the Breath of Life. This biodynamic potency is rhythmically expressed within the fluids at an average rate of two-and-a-half cycles per minute. Potency becomes infused in the fluids which irrigate the whole body and convey this vital force to all regions. Therefore an unrestricted motion of fluid within the body is critical for the dissemination of biodynamic potency and the maintenance of health. The biodynamic potency of the Breath of Life has been described as the “energy free to act within the fluids.”11 This potency may be experienced as a kind of “fluid within the fluid.”12 A similar concept is found in Chinese medicine, where the fluids of the body are also considered to carry vital forces and a basic ordering principle. It is important to remember that all living tissues are primarily composed of fluid. Since the early days of this work, Craniosacral practitioners have recognised the significant role of cerebrospinal fluid (C.S.F.) in carrying the potency of the Breath of Life. C.S.F. is the “juice” that bathes the central nervous system. It is also the vehicle into which biodynamic potency is initially expressed in the body. C.S.F. can thus be seen as a principal link between the potency of the Breath of Life and its expression in the body. The long tide is a wider field phenomenon that may be perceived both within, as well as around the body. It is a global force that becomes individuated; it operates as a vast field of action that manifests locally as the organising “wind” of the human system. This can be perceived as rhythmic spiral motions within a large field of action that become oriented around the midline of the body. The long tide essentially creates and maintains our form and function. Perceiving the long tide is like dropping down near to the ocean floor. The long tide directly underlies the mid-tide, serving as the force behind it. The other, faster rhythms are generated from the long tide, as the Breath of Life becomes embodied through the fluids and unfolds into its outer manifestations. 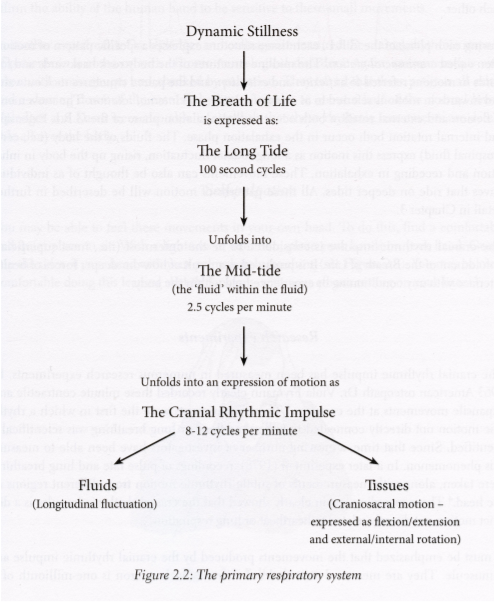 Each rhythmic cycle of the long tide is expressed at a rate of about once every 100 seconds. It acts as our most essential life breath and has a light, airy quality as it permeates the body. This is sometimes experienced as a shimmering, a vapour, a subtle radiance or electrical wind. It seems likely that all living organisms are essentially maintained by this rhythmical action of the long tide — the most formative and generative force in our world. Similar rhythmic movements have also been identified in singlecelled primitive life forms called protoplasm. A rhythmic phenomenon within the viscous substance of protoplasm called protoplasmic streaming is wellknown to biologists. This motion is a fundamental expression of the life principle and also has a regular rhythmic rate of one cycle every 100 seconds. No matter what the conditions, the rhythmic forces behind protoplasmic streaming continue as long as the organism is alive.18 In fact, our own bodies can be seen as just more complex forms of protoplasm. In comparison to the faster tides, the long tide is not affected by the vagaries of day-to-day experiences and conditioning. It is the expression of our fundamental health that is never lost, and which continues whatever else is going on. It is very stable in its nature and rate, as it gently resonates and rhythmically permeates the body from the core of our being. At a profound level, the long tide contains the knowledge to create healing. It is at the foundation of all regulatory functions of the body and clinically, its emergence indicates a reconnection to our deepest resource of health. From our deepest source, the Breath of Life is conveyed in a series of unfoldments described above as three tides. However, at our very core there is a state of pure, un-fabricated being and stillness. This is the place of our deepest nature. This essential ground state is underneath all our individual traits, our personality and all our doing. It is our being. It is like the ocean floor. All expressions of life emerge out of stillness. As our being manifests into becoming, the Breath of Life starts to express itself as a succession of motions. This sets up the different tidal rhythms of the primary respiratory system. From the formless, life starts to take form. This process can be compared to how a wheel turns. At the hub of the wheel there is stillness. However, as you move towards the periphery motion takes place at a faster rate. Essentially what is being described here is a coming about of our individuation, our emergence into form. This process of creation is happening each moment of our lives, and is organised around the creative intention of the Breath of Life. It was described by Dr. Sutherland as a “groundswell. "20 The groundswell of the Breath of Life refers to the stirring of life as it manifests from the ground of our being. The body is in a constant state of repair, regulation and regeneration. At each moment, the vitalising forces of the Breath of Life hold the whole process together, bringing order and integration. In this continuous process of creation, our form and all our physiological activities are being generated and maintained by the expression of life’s creative impulse. 3 John M. McPartland D.O., M.S., and Eric A. Mein M.D., “Entrainment and the Cranial Rhythmic Impulse,” Alternative Therapies 3.1 (January 1997). 7 Phrase coined by Franklyn Sills M.A., R.C.S.T. 8 Anecdote from Colin Perrow R.C.S.T. 16 N.B. Some practitioners also refer to an even slower motion, which arises as a kind of wellspring with each outgoing upsurge, occurring about every 20-25 minutes. This motion keeps rising and spreading out into space until a new “tide” arises.